This article was published in +977 (a Nepalese Lifestyle Magazine in Australia) in August-September 2013 issue. I am an IT graduate and I have been working in the IT industry for a while but if a decade ago someone saw how I was with computer, then they would have advised me to never go near computers. While growing up, I didn’t have the luxury of playing with and learning computers like kids todays do. I don’t know how these kids’ tiny brain are wired that they know what to do with the iPhones and iPads but back when I was young, my brain was seemed to work in a straight line. I used to go out to play with my neighbours’ kids and we had dolls, play hide and seek or just run. Some days we came home with dirt all over our clothes and face but it used to be a fun filled childhood. The closest I came to technology was owning an LCD brick game. I am not sure if any of you remember those but they were Tetris type old game with awesome sounds and I have to admit it used to be so much fun. We owned only one so sometimes I had to fight with my brother to play it. Anyway, when we were in school, computers were just coming slowly to Nepal. I was in year 5 when I saw a computer for the first time at school but not until I was in year 6 that my uncle bought a computer at home and I was able to use it. He was teaching computers at one of the schools so it was essential for him to own one. But those days not many people would buy a computer as it was super expensive, I think prices started from over RS 50,000. And those computers were not as fast as the ones we have today being an Intel 80486 with black/ blue screen. I still remember learning MS Dos on it. And who can forget the floppy disks and the trouble we all had with them. The new computer at home was the new toy for everyone and especially to my uncle. He used to work hours in front of the computer and used to program and do other stuff I didn’t understand. After a while, I got to know that there were a few very interesting games installed on the computer. My uncle taught us how to play some of them and they were so addictive. Not only was it fun but as a kid it was a different world. The bad part about this all was that we were only allowed to play on the computer supervised. Rest of the time the computer was out of our reach as it was password protected. So, one day when my uncle was starting the computer, I watched what he did and saw that he hit four stroke on the keyboard where it said password. It came as asterisks on the screen. I wanted to learn all about this new device so I tried to remember the password. I know everyone must be thinking what an ignorant kid I was but in my mind, that is exactly what I saw. And I had no way of knowing anything more about computers until I took computer classes in school few years later. Today when I look back and remember that incident, it makes me laugh thinking that the girl who didn’t know anything about computers is working in an IT industry now. 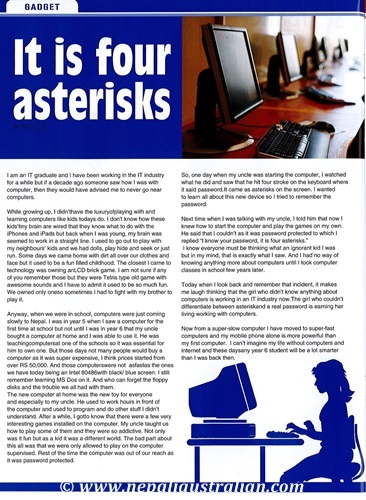 The girl who couldn’t differentiate between asterisk and a real password is earning her living working with computers. Now from a super-slow computer I have moved to super-fast computers and my mobile phone alone is more powerful than my first computer. I can’t imagine my life without computers and internet and these days any year 6 student will be a lot smarter than I was back then. 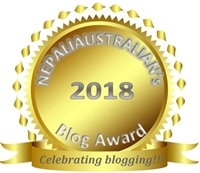 This entry was posted in Published and tagged brick game, children and computer, computer, gadgets, gaming, intel 80486, IT professional, kid's brain, M from nepaliaustralian, nepali australian, Nepaliaustralian, password, technology, tiny brain. Bookmark the permalink. Good story… there are all these markers along the course of our lives. The older we get, the more things change, the more we filter our old experience through what we know now.